Heat the oil in a 4-quart pot or a wok until a deep-fat thermometer registers 360°F. Put the beer in a wide bowl and stir in the salt. Put the flour in another wide bowl. Cut each quarter of avocado into 3 long wedges and dunk the wedges first in the beer, then turn them gently in the flour to coat. Transfer about 6 avocado slices at a time to the oil and fry until a light-golden crust forms, 1 to 2 minutes. Transfer to a paper-towel-lined plate to drain. 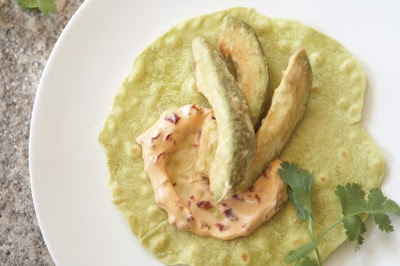 Fry more avocado slices in the same manner until all slices have been fried. Make tacos with 3 slices of avocado and the accompaniments. These look delicious!! I added to my Vegetarian board, I would totally eat these! Thanks for sharing at #bloggerspotlight! Don't forget to come link up tomorrow night and see who got featured!